The Regional Court in the Bulgarian city of Bourgas has found Valeri Simeonov, currently a Deputy Prime Minister and co-leader of the United Patriots coalition, of breaking anti-discrimination legislation by his comments about Roma people, made in Parliament in December 2014. His conviction by the Bourgas Regional Court is at first instance and is subject to appeal. The complaint against him was lodged by journalists Kremena Budinova and Ognyan Isaev, both of Roma ethnicity, who are being represented by the legal programme of NGO the Bulgarian Helsinki Committee. 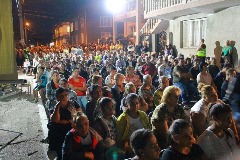 Residents of the largest Romani neighborhoods in Bulgaria took part of a ten-day seminars to hear the scripture preached by Erick Flickinger from the evangelic ministry of the Seventh-day Adventist church from an outside platform. After the seminar ended, 52 people found salvation in Jesus and got baptized in the company of friends and family members. This made a good impression on others and therefore, 450 people started studying the bible while waiting for the day of their own baptism. On 23 October 2017, the 14th Meeting of the Ad-Hoc Committee of Experts on Roma and Traveller Issues (CAHROM) took place in the Council of Europe in Strasbourg. Over 90 participants participated, including national experts from 36 member States, various CoE bodies, and representatives from European Union (EU) institutions, international governmental and non-governmental organisations.